A flame within a chalice is a primary symbol of the Unitarian Universalist faith tradition. 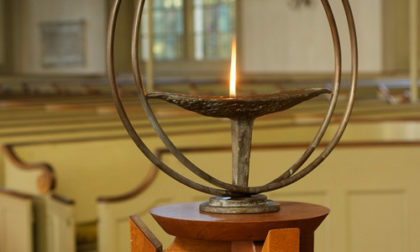 At First Unitarian, we light a chalice each Sunday in our worship service and in other gatherings. When we light a chalice in our Sunday service at First Unitarian, it symbolizes the creation of a reverent space for reflection, prayer, meditation, and singing.